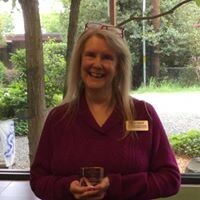 As we have since 1945, Mercer Island Library staff works with our many community partners to make the library a hub of free and engaging programs, activities, and resources for all ages. In 2018, we were especially proud to be honored by the community. 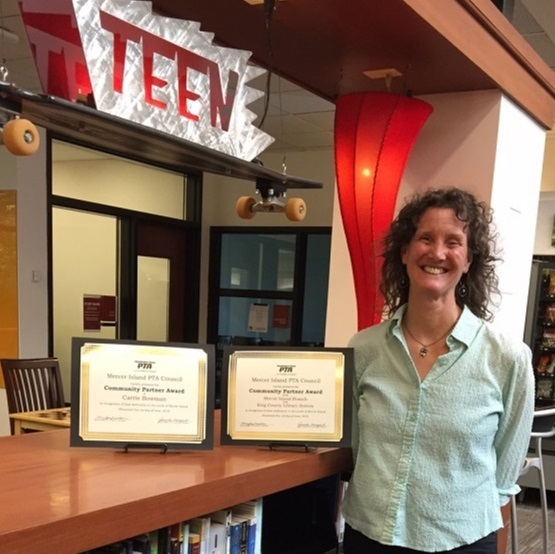 Mercer Island Library and Teen Librarian Carrie Bowman received Mercer Island PTA Council Community Partner Awards for dedication to the youth of Mercer Island, and both Carrie and Children's Librarian Linda Ernst received Outstanding Community Partner Awards from Mercer Island Youth & Family Services Healthy Youth Initiative for work on youth and family issues. Fostering early literacy through story times with nationally recognized early literacy expert Linda Ernst is one of the pillars of our library programming. Whether it is story time in the branch or outdoors in the park, this library staple promotes literacy and healthy child and family development. One especially touching story this year came from a parent whose child had a speech issue and who, after attending Miss Linda's story times regularly, "went from a scarce vocabulary of five words to speaking in full sentences to everyone he meets." His mom says that coming to story time "is one of the best things I've ever done for my son." When our librarians work their hearts out for kids and families, praise just doesn't get better than that. Our partnership with Mercer Island Youth & Family Services took Linda’s expertise online; providing brain development tips and strategies to families through a three-part Facebook Live series. Linda also provided PEPS programs for young families and co-hosted programs with Mercer Island music icon Nancy Stewart in her Sing with Our Kids campaign. Concerned about the persistent presence of anxiety among Island teens, Teen Services Librarian Carrie Bowman brought together school district officials, parents, and mental health counselors to address issues related to teen stress, anxiety, and mental health. She didn’t talk just to adults though; she also spent time talking to teens to make sure they helped frame the conversation. She guided presenters to work through a stress reduction lens when presenting programs about writing college essays, choosing a college, and getting financial aid. All are topics in great demand on the Island, but were presented this time with an eye to reducing stress, not creating more. Carrie also partnered with Mercer Island Parent Edge to present a film screening and panel discussion of the documentary, Angst, which addresses the tremendous anxiety often found in our kids, with over 350 people attending. Our partnerships have really helped us become part of the fabric of Mercer Island. 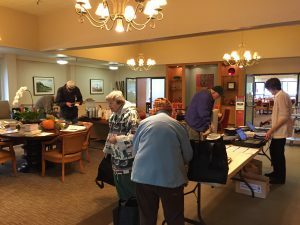 We have collaborated with groups such as the Mercer Island Historical Society, the Mercer Island Arts Council, and the Mercer Island Emergency Management CERT team. We covered topics as diverse as the history of Chief Seattle, to an art discussion of photographer Edward Curtis, to personal disaster preparedness. Outreach is another pillar of what we offer. 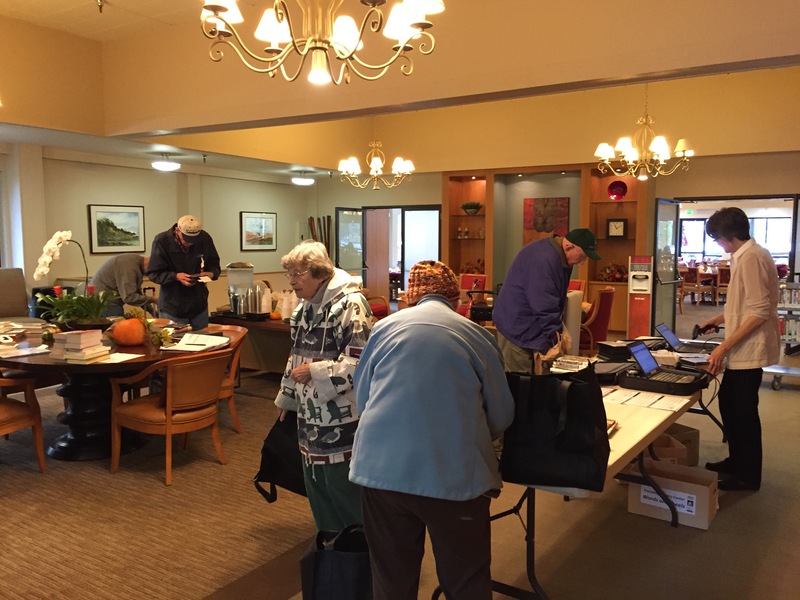 Through our KCLS Outreach team, we regularly visit senior communities on the Island, bringing library materials and services directly to those that can’t easily make it to our branch location for eBook instruction and other one-on-one technology help. Our Library2Go Bookmobile also visits daycares and preschools on the Island to connect kids with books. Our librarians attend Leap for Green, Family Night: Around the World, and Summer Celebration. (We love a parade and got lots of cheers from our library fans, thank you!) We attended Mercer Island’s National Night Out alongside the Mercer Island Police Department. We provided support or programs for events at Stroum Jewish Community Center, PEAK, Aljoya, Covenant Shores, Mercer Island High School, St. Monica Catholic School, Islander Middle School, and promote reading in all our elementary schools. Through KCLS funding and with additional support from the Friends of the Mercer Island Library, we were able to offer a vast range of programming. In 2018, we offered Opera Preview, travel programs, music concerts, and STEM. We hosted programs on navigating challenging conversations, smart investment strategies, Medicare, art and music workshops, storytelling, and Reading with Rover. We provided informative programs on bullying, cyber-security, downsizing, safe storage of firearms, and preparing for a disaster. On top of that we had programs on writing, film making, estate planning, parenting, college admission, and “living your best life”. It takes a village to create and support a community as incredible as Mercer Island. We at Mercer Island Library are honored to be a part of the village. If you haven’t visited us lately, stop by and say hello and discover the depth of resources and service your library provides. We look forward to seeing you!